Deb's Cup of Tea: You have what here? Sunday, we were walking out to the car after church and Carole says to David, "I want Tim Hortons for lunch." I came to a dead stop. "Tim Hortons? Tim Hortons is here? In Connecticut?" David looked at me quizzically and shrugged, "Well, um, yeah. They are all over New England." For those who don't know, Tim Hortons is a Canadian institution. They are akin to Dunkin' Donuts but with less donut selection and more items at lunch. They are famous for their soups and they offered soup before it was commonplace to do so. 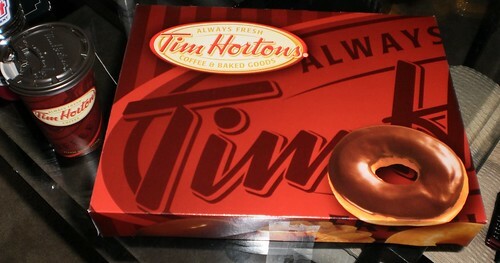 I encountered Tim Hortons when I had a friend in Port Perry, Ontario, Canada. For 4 years, I would travel, twice a year, to visit Margaret. I knew I could stop at Tim Hortons and get good food at a good price. They also offered hot tea, something American places hadn't yet discovered. So, I was thrilled to be headed to Tim Hortons for lunch. I got a good turkey and swiss deli sandwich. Carole had a sandwich and a nicely spiced pumpkin muffin. David had a bagel. 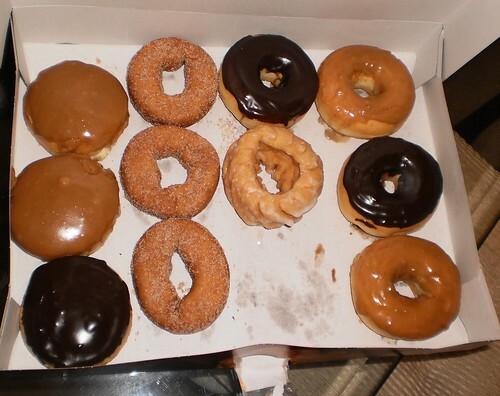 We also got a dozen donuts. We were intending to nosh on donuts later in the day but we decided to head off and be tourists so the donuts sat overnight. On Monday morning, I ate the triple chocolate donut and then realized I should have taken a photo of the whole box. A day later, they were a bit stale, but day-olds were something I lived on in college. The triple chocolate, a donut with chocolate frosting and filling and topped with mini-chocolate chips, was okay, but I had one of the sugar frosted and those were much better. On Sunday, I got a cup of hot tea that was as good as anything Starbucks could make and for 75% less cost. As I sit here having had my Cheerios, I remember Tim Hortons. They compete with Dunkin' Donuts in the Northeast and I think I'd find myself at Tim's if he made it to the Chicagoland area. Just heard this morning that all but two US Tim Horton's have shut down yesterday. Like locked the doors, went home, and never came back.